As the size of our iOS devices keeps on increasing, the way we perform different tasks and use different apps is also changing. On iPhone 6s Plus, which offers a larger display we may want to use a particular app in a different way, then we do on a smaller iPhone 5s. EasyAppOrientation tweak brings a useful feature to jailbroken iOS devices, enabling them to lock the orientation of any app in direction of their choice. The app lets you customize and select a different setting for each app individually. How this works is simple, if you want to lock the orientation of the Mail app to ‘landscape right’, while you want to continue using the Notes app in portrait mode, then you can do so with this hack. This does not affect the overall orientation settings of the device or in apps that have not been configured with EasyAppOrientation. To change orientation of any app simply launch the Settings app and select the orientation mode you want to enable for any app of your choice. On the next page turn the toggle for that particular app on. 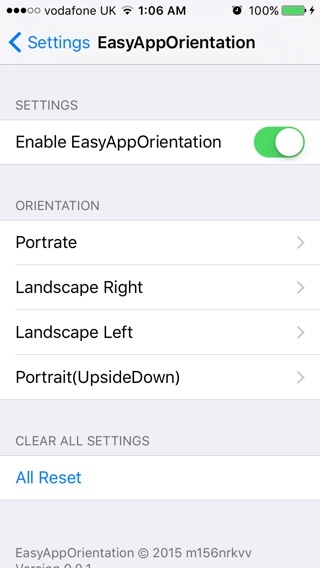 Now every time you launch that app, it will be in your previously chosen orientation by default and will stay that way until you change the setting from EasyAppOrientation tweak’s settings. You can download the EasyAppOrientation tweak from Cydia for free. It works well with iOS 9 and iOS 8 powered devices.